If you know me you know that for years I've been making pickles, mostly dill pickles. I never really thought of it as "fermenting." 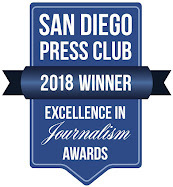 But I recently researched and wrote a story on fermenting vegetables for the San Diego Union-Tribune which will appear on August 15. It was then that I realized that fermenting was exactly what I was doing. Thanks to my friend Curt Wittenberg, who has been my guru through this, I decided to branch out and pickle other vegetables using a salt brine. (Pickling with vinegar is just pickling.) 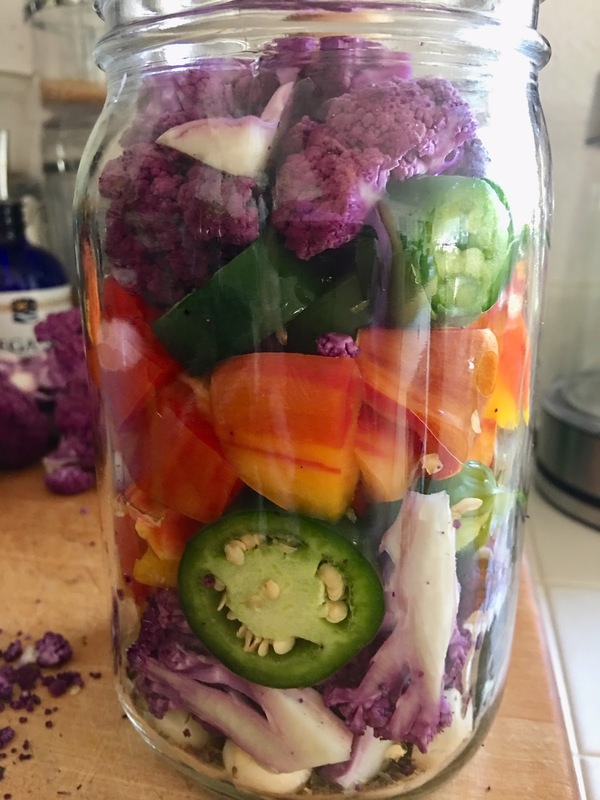 And that's what I started this afternoon with a simple quart of vibrant purple cauliflower, a pretty red and yellow stripped bell pepper, huge jalapeños, and lots of garlic cloves. I kind of had the makings of a giardiniera so I thought I'd use the seasonings for that: black peppercorns, dried oregano, celery seeds, and red pepper flakes. No olive oil, though. 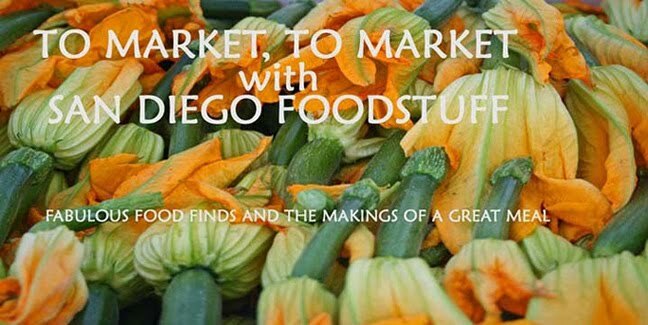 And, by the way, this is the perfect post-farmers market shopping project. Do it with your kids or grandkids. Hey, it's a science project! I had forgotten that several years ago I had contributed to a Go Fund Me for a little company called FARMcurious that was creating a fermenting set, with lids, stoppers, and airlocks. The set locks out air--and mold and yeast--and provides an escape for carbon dioxide. As a funder, I got one and put it in my garage--and it just became part of the landscape of the shelves. But no more. I pulled it out and was almost ready. 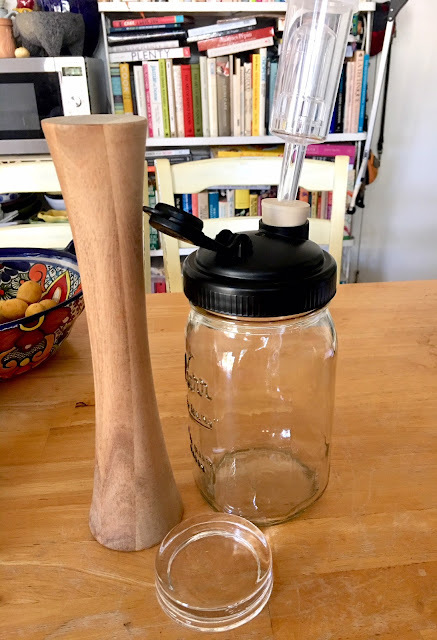 But in interviewing Curt I realized I needed two other tools I didn't even know existed (I had jars): glass fermentation weights, to make sure the vegetables stay covered by the brine, and a vegetable tamper, which you use to cram as much produce into your jar. I ordered those from Cultures for Health, and they appeared yesterday--yes, on a Sunday! The process is simple. Chop up the vegetables to the size you like. Make a salt brine. Make sure everything you touch--from the jar to the fermenting set to the tamper to the weights--is perfectly clean. Then start filling the jar. Add your spices first, then the vegetables. You can layer them by vegetable type or mix them up. I layered these. Tamp them down. Then add the brine. Top with the weight (and carefully pull out any little random pieces of vegetables or spices. Screw on the lid of the fermenting set. Set it out on your kitchen counter, away from direct sun, and let science do its work. That's it. If you don't have a fermenting set, no worries. I never used one before and have been making pickles for seeming centuries. Instead use a clean lid and "burp" the jar, meaning slightly loosen it and then tighten it again once a day for the first few days. This lets that carbon dioxide escape. Here's a quick note from Curt about the proportions for the brine and vegetables. In short, it's kind of improvisational. 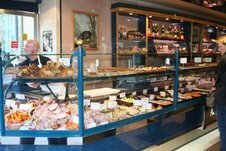 It depends on the size of the vegetable pieces and their density. So, he suggests having an extra bottle or bottles in different sizes in case there's overage. You can always rummage around your fridge and add more vegetables if you didn't prepare enough for another quart jar. And save any excess brine to add in case some bubbles out of the bottle or to add after you remove your pickle pebble and want to start sampling. After a few days or up to 12 days (I'm going for five days, at Curt's advice, given the hot weather), unscrew the fermenting set and replace it with a regular screw-on lid and refrigerate. Then eat! Add these to a sandwich or a cheese or charcuterie platter--or just snack on them. So, here we are on Day 1. I'm hoping: A) No mold develops and B) It tastes terrific. 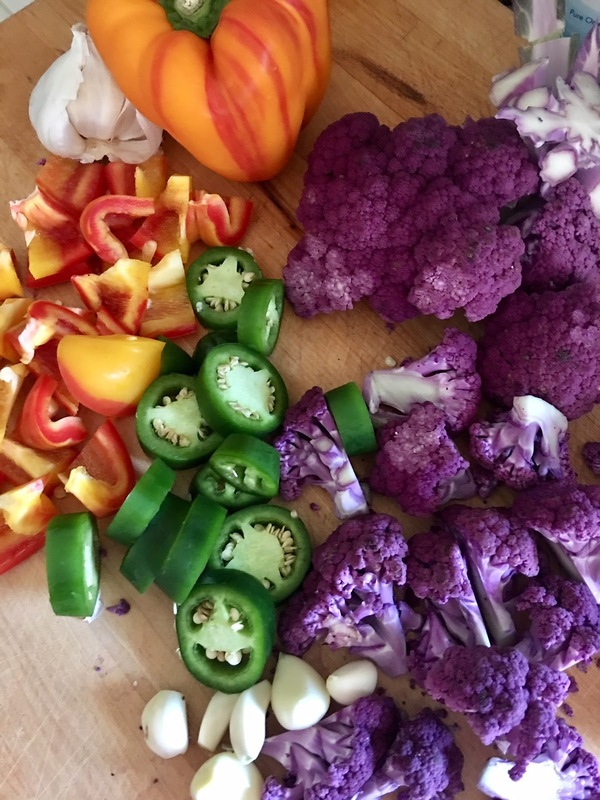 I already know that those vibrant colors of today will fade but with luck/science, the colors will be replaced by big flavor. In a quart jar add the oregano, red pepper flakes, celery seeds, peppercorns, and the garlic cloves. 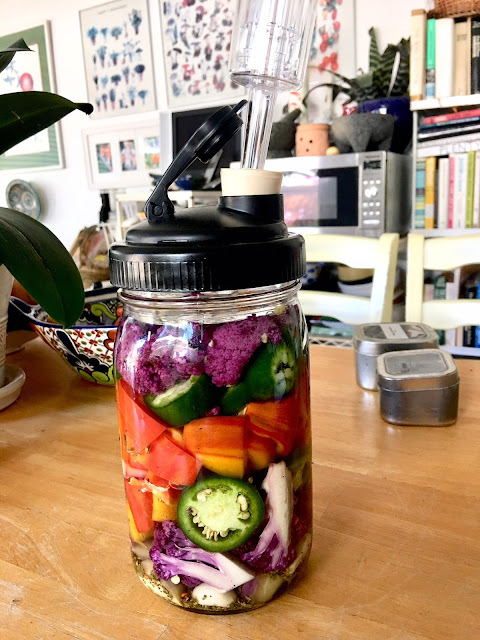 Fill jar with vegetables, leaving about 1 ½ inches of headspace. Pour brine over all, just covering the vegetables and leaving the headspace.